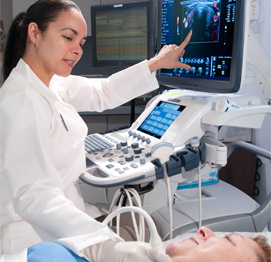 The Brooklyn Hospital Center (TBHC) has some of the most skilled Radiologists and advanced imaging equipment anywhere in New York. With a new state-of-the-art CT, MRI, Ultrasound, SPECT/CT, digital angiography suite, and a computer-guided linear accelerator for cancer patients, we’ve raised the standard of care for radiology in downtown Brooklyn. We’re proud of our cutting edge tools, but we’re even prouder of the technicians who operate them and the doctors who interpret the images they produce. With four years of medical school and at least five years of post-graduate training, our board certified Radiologists make the complex interpretations of radiologic images necessary to diagnose and treat disease. We use the latest technology to determine the nature of your illness. After diagnosis, we measure your progress throughout the entire course of treatment. The Brooklyn Hospital Center's board certified Radiologists will make sure your child receives the smallest amount of radiation throughout his or her diagnosis and treatment. Only the indicated area is imaged and multiple scans are avoided whenever possible.